You better buckle up this June, so you can jump on Sky Bingo‘s Roll on Rollercoaster and ride to the £60,000 prize! You can cruise through Sky Bingo's promotion until June 30th. You may have a little competition, but if you're one of the lucky 30,000 players, you can still join the race for your share! 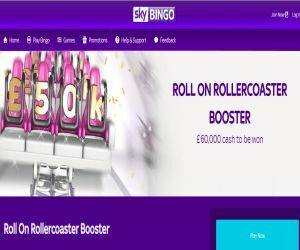 With tickets as little as 5p a game, you can play Sky Bingo's roll-on games to hit the £50,000 cash prize. You can check the site for the jam-packed schedule, but each roll-on game is bursting with at least 13 prizes and will be hosted in selected Sky bingo rooms daily between 3pm and 12pm! The excitement doesn't have to end there! As you can also race for your share of £14,000 cash playing Sky Bingo's Escalator Jackpot games! The Escalator Jackpot rides will also be hosted between 3pm and 12am daily in selected rooms with varying ball counts, which will escalate every 2 hours until the jackpot is won. You'll be able to hop on these rides on Monday, Tuesday, Wednesday, Thursday and Sunday. To spice up the game, on Friday & Saturday, the escalator jackpot rides will kick-off from 7pm to 11pm, and the ball count will start at 40 and escalate by 2, each hour until someone hits the jackpot! The best part is that each escalating jackpot will offer community prize, which will be split 50% for the main winner and 50% between all the other roomies who bought tickets for the game. You can also buy as many tickets as you want, to boost your chances of riding high to Sky riches!